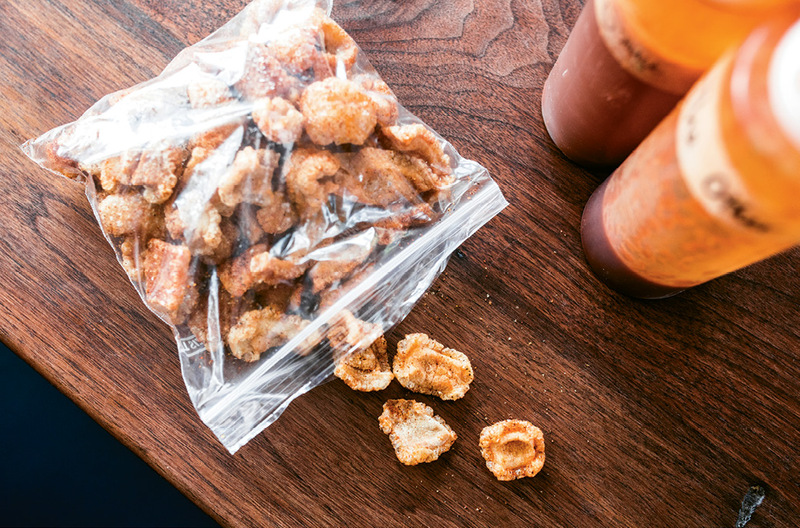 SNAP, CRACKLE, POP: Cracklins, made up of deep fried pork skins puffed to a crisp, are sold by the bagful. 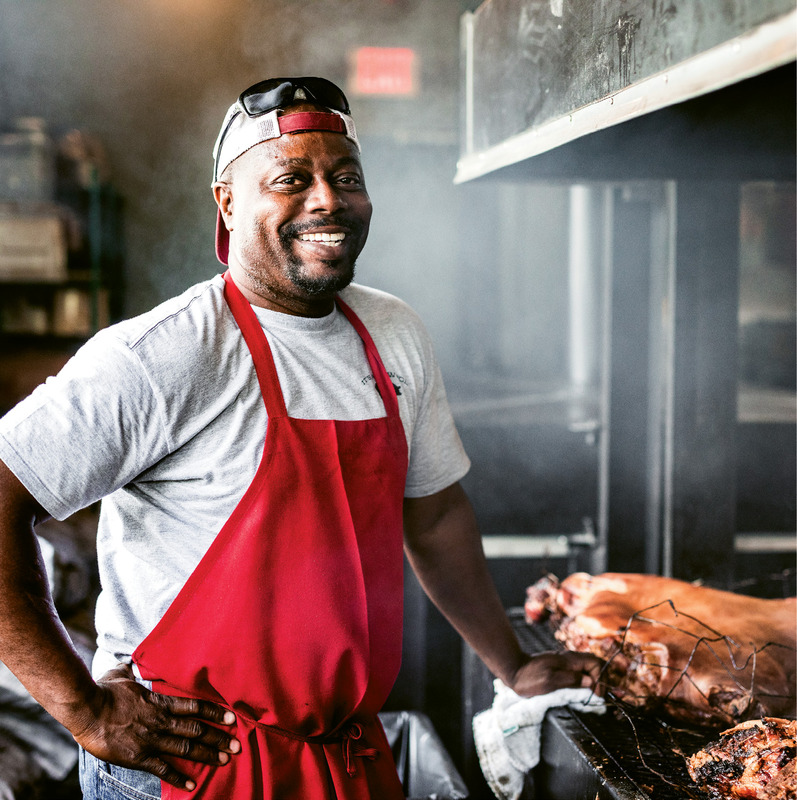 Meat Man: Rodney Scott smokes the entire hog for his dishes, pulling off tender meat and skin for ribs, sandwiches, cracklins, and more. BETTER THAN PHILLY: A riff on the Philly cheesesteak, Rodney’s ribeye sandwich is piled high with thinly sliced meat, melted cheese, and caramelized onions. A retro letter-board menu greets customers. 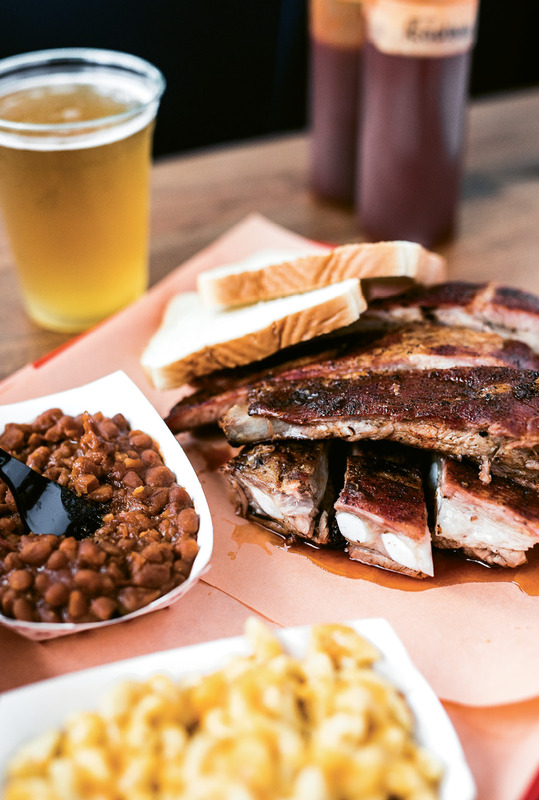 A plate of smoky ribs, sugary baked beans, and mac-n-cheese. 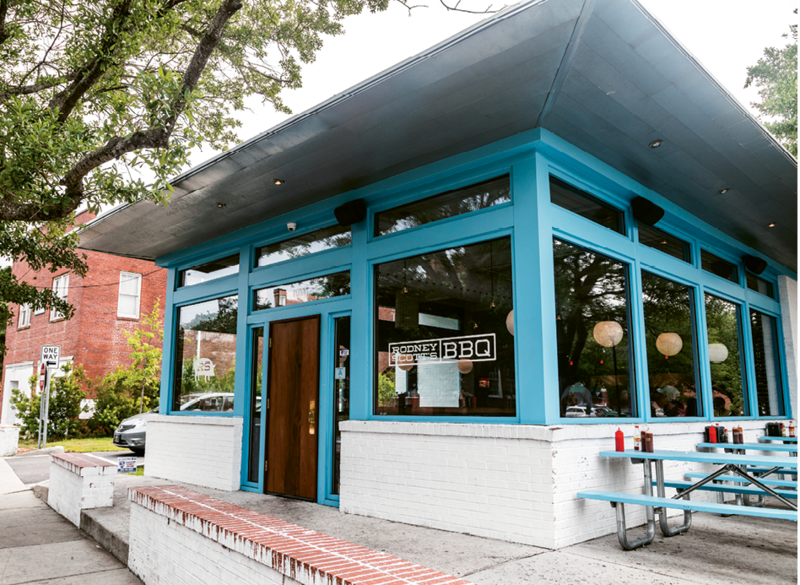 Blue booths uphold a nostalgic vibe. The lyrics of "Can’t Get Enough of Your Love, Baby" by ’70s crooner Barry White ring true moments after my indulgent rendezvous with a ribeye sandwich (more on that later). And a little of Scott’s love goes a long way. I witnessed this personally a few years back, when I volunteered to help serve his famous pulled pork to the masses at Palmetto Bluff’s annual Music to Your Mouth food festival. All day, I watched Scott transfer wedges of split hickory and oak by the shovelful to a nearby pit, where a hog lay atop wire caging. When evening came, Scott flipped the beast (a well choreographed, two-man job). He then dusted it with seasonings and mopped it with fiery sauce that seeped deeply into muscle, infusing the meat with his signature blend of spice and tang. At service time, Scott swiftly hand-pulled glistening strands, strips, and nuggets for each awaiting plate. It used to be that in order to experience Scott’s ’cue, you either had to fork out some cash for a food festival like that or make the 90-minute pilgrimage northeast of Charleston to rural Hemingway, South Carolina, where the Scott family has been pulling pork at Scott’s BBQ for more than three decades. Rodney smoked his first hog when he was 11, chopping down neighboring oak and hickory trees for wood. Now his father and eldest son keep those fires burning, while Scott flies solo. Of course, nothing can match the authenticity of the original, where half the fun lies in its total lack of pretense: the floor of broken-down cardboard boxes, the church pews on the front porch, the growl of motorcycles pulling into the gravel lot. 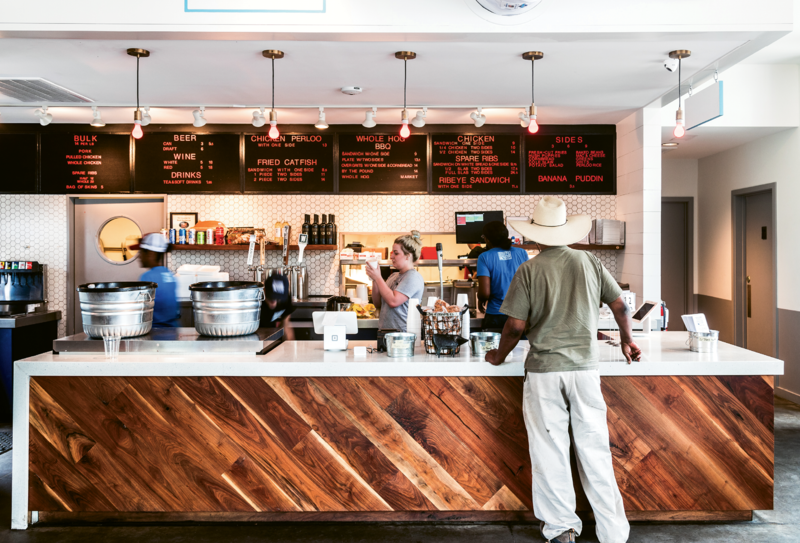 Rodney Scott’s BBQ in Charleston, by contrast, brandishes minimalist lines and slick logos. Here, you’re much more likely to hear the sputtering of a scooter than the reverb of a pickup truck. Yet Hemingway echoes in the turquoise trim on doorways and picnic tables. Cantilevered state-of-the-art smoke pits have seen round-the-clock operation since Scott opened his doors in early February, and already the pit room feels cloaked in its own authenticity. Smoke wafts through a screen on the sidewalk, luring passersby who peer in and strike up conversations with the pit crew. Longtime friends from Hemingway deliver hogs twice a week, fist-bumping their hellos. The mood is communal. Construction workers stand in line with bow-tied attorneys. Plumbers kindly make room at the picnic tables for fashionable tourists from New York. Inside at the long community table, a mother wipes sparerib sauce from her son’s fingers next to an elderly couple polishing off creamy banana pudding. 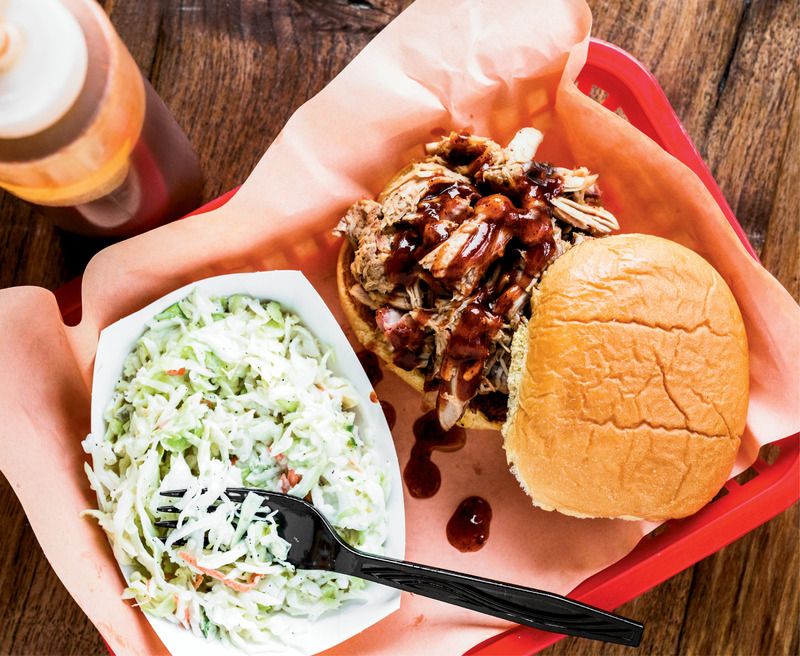 Black and white, old and young, local and not, it seems barbecue brings everyone together. Scott’s menu riffs on classics, packing heat where you least expect it. His hushpuppies come laced with onion and a surprising kick of what I’m guessing is cayenne. He works spice into crisp coleslaw. There’s extra bite to his fried catfish sandwich and a solid dose of pepper in his collard greens. Cracklins (deep fried pork skins) are downright fiery. Maybe he wants us to sweat a little. I respect that. 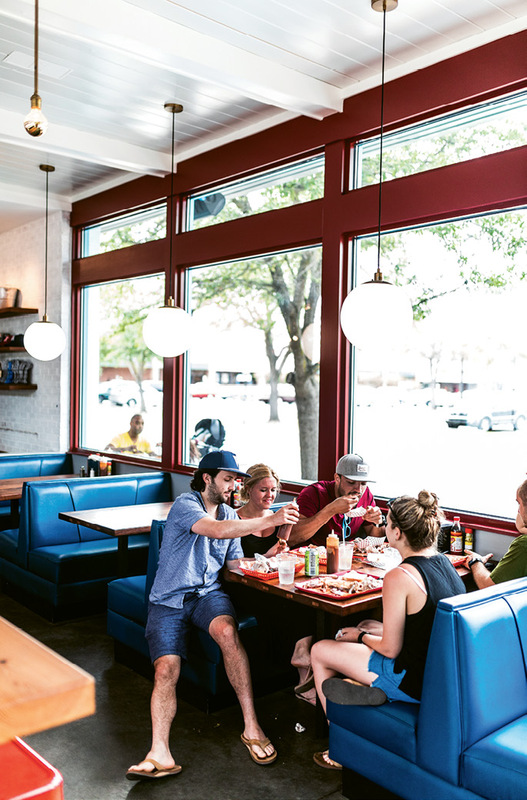 On the mellower side, baked beans come with just enough brown sugar to not be overly sweet, while the mac-n-cheese is classic, down-home goodness. A novel twist on shrimp and grits is Scott’s “pork & grits,” a smoky, satisfying dish with a hint of what tastes like Scott’s vinegar-pepper sauce—either that or pork drippings, but let’s just call it love. For me, the pithouse standout is the ribeye sandwich, a nod to Scott’s Philadelphia birthplace (he was a year old when his family moved to Hemingway) that’s better than any Philly cheesesteak I’ve ever tasted. 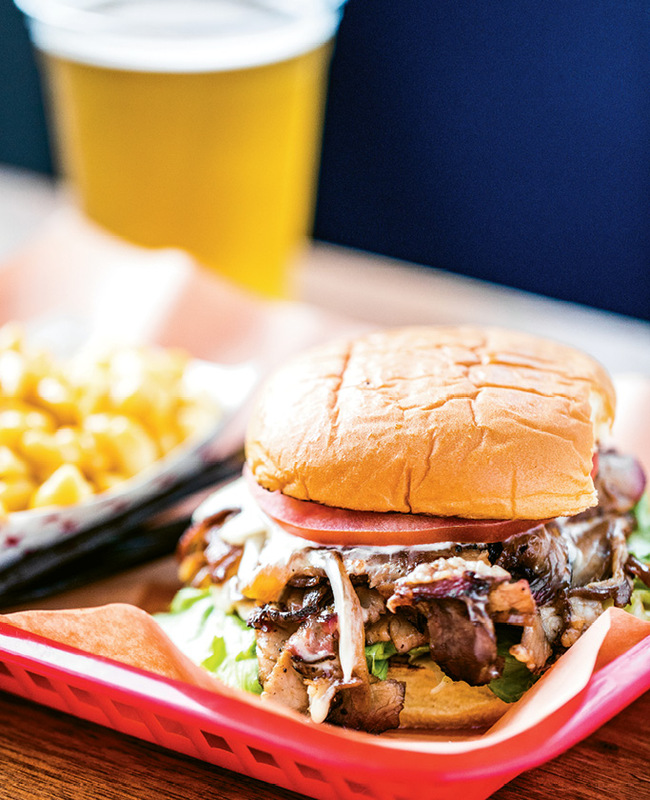 Scott marinates his ribeye and slow-smokes it to perfection, slices it exquisitely thin, then finishes it off on the flattop before piling the meat high on a bun and smothering it in melted white cheddar and ringlets of caramelized onion. I ordered the sandwich to-go, intending to eat it at home, but the aroma of smoky loin meat was more than I could handle. Slowing my car at the railroad tracks on Huger Street, I told myself, “Just one bite,” and sank my teeth in. I’m sure I must have groaned a baritone worthy of Barry White himself. Thank you, Rodney Scott, for bringing us the love.